Has the game finished? If not, here's two routes from my favourite crag. The first is a view of a climb, the second is a view from a climb. This obscure route is in the Wolgan, at the Coke Ovens. Another classic old-school '13' called Barrel Organ. Apologies for the esotarica, I thought a local might recognise it. The first pic is extremely foreshortened and is looking up any of about 6 routes. Yeah I don't know the route the climber is on (without cheating with a guide book...) Criminal Streak is on the left and Mr O and some other route of Rob's are on the right I think?? Pic B - also moonarie, looking out at what seems like the lower tiers below the southern crags - so I'm guessing somewhere on Checkers wall in a chimney, but I'm not sure where. a) My guess would be that the climber is on the first pitch of feeding frenzy. As it was the first climb up the prominant verticle wall above i suspect it took the line of least resistence up to that wall. In any case that is the area. b) my guess is kneedeep chimney (othewise great chimney). the view is the wrong way to be from checkers wall. Ronny and stugang are close enough. a) is the first pitch of Free for All (16), Checkers Wall. It then heads off L to the top of the cliff (the top pitches get a bit scrappy). There are bolted routes to the L and R in the picture, including Mr Ordinary, and they're all good. The big shadowy corner up to the roofs is Casablanca, undoubtedly a big day out but I haven't climbed it. b) is from the top of the little chimney in the Great Chimney, 2 or 3 pitches up Shangri La (14). There's a cool little garden up there, a good climb on a hot day. OK since you lot are all so good at this, can someone identify this route for me? It's probably in the King Rat area, but I can't be sure. >OK since you lot are all so good at this, can someone identify this route for me? >It's probably in the King Rat area, but I can't be sure. I'm guessing it is Speedy Lou (18) on Slander Wall in King Rat Gully, (just R of Chubby Like Chris Part 2). Screaming Tribesmen? 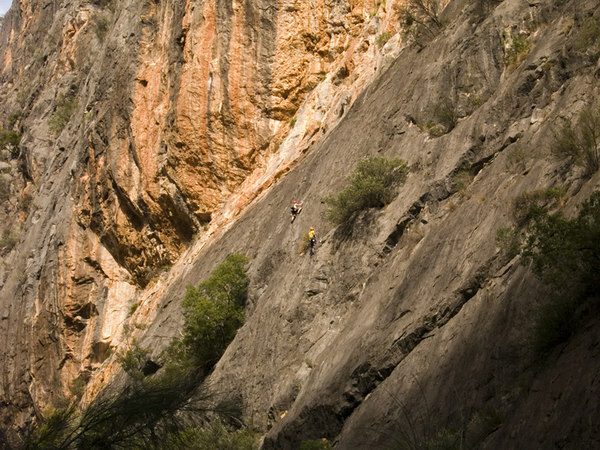 ... (or something like that; ... it's been a while now since I did it), at Bungonia Gorge. I don't think you're too far wrong M9 - what about Nitro Express? yeah its all stopped, maybe I should have given a clue (& yes you were close). Iron Curtain (22) at Bungonia. Where does it go from there, James?